‘The Tale of Tom Kitten’, published in 1907, is our first introduction to Tom who later appears in ‘The Tale of Samuel Whiskers’. In the story based at Hill Top Farm, we also meet many other characters from the little tales including Tom’s sisters, Moppet and Mittens, Mrs. Tabitha Twitchit and Jemima Puddle-Duck. The story of the little kittens and their struggle to stay clean and tidy for their mother’s guests was so popular that in June 1917, a painting book in Tom Kitten’s name was released. This is the first official United Kingdom coin to feature Tom Kitten. 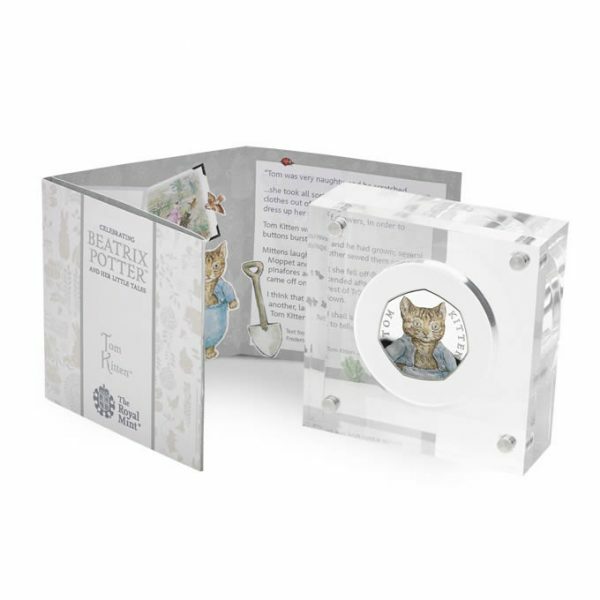 The playful character has been captured on this 925 sterling silver coin, with Tom Kitten’s fur and ill-fitting outfit highlighted with colour printing and enhanced by the coin’s Proof finish. 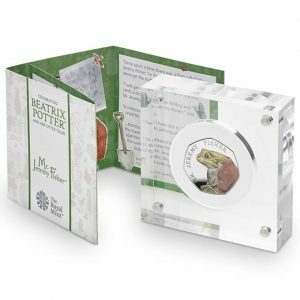 The coin comes in a clear acrylic presentation case with a booklet on the mischievous cat and his adventures.